We might as well share with you some of the progress and updates we have implemented into our mods over the past month. • Lightning flashes added into storms that illuminate everything. • NVG have been added back to everybody for use without a perk. 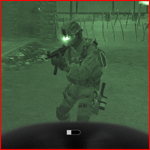 • NVG now have a battery, which drains during use and recharges when not in use. • NVG perk recharges batteries quicker and extends battery life. Note: HitLoc may be missing some of the above features, but they are planned. • Non-mandatory controls can be assigned for each individual fire mode and to drop weapons. • Dropping weapons increases you speed. • Dropped weapons will remain on the ground until picked up. You can horde weapons and come back for them next round. • Spider Mines have been added which ensnare anybody caught within them. Most of the work has been on Obscurity. We have a lot more new features and changes planned, which we will soon reveal. These updates are not officially released for download, but are available for viewing in the OC1 server. We have created a section dedicated to helping players understand our mods and all of their features. You can view this section by visiting Game Guides page. The guides will take on an article type structure, so there will not be one definitive guide to follow. 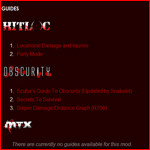 For example in the HitLoc category there is a guide for Locational Damage and a guide for Party Mode. At a later date, you may also find more information on Party Mode within a HitLoc Gametypes guide etc. You can access the game guides at any time by using the Mod Game Guides panel link displayed on the right of the home page. If anybody wishes to contribute guides to any of our mods, feel free to create a topic within the correct “Help & Tutorials” section of the forum relevant to the mod you wish to contribute to. If the guide is helpful enough, we will add it into the game guides database. HitLoc: Let the party begin! We have added a heap of features to HitLoc lately, but they have all been on the serious side. With that in mind, we decided to go a little crazy and create a completely new gametype for all those people who to want to have some good laughs whilst still popping caps into enemies HitLoc style. We came up with the highly innovative and original name of…HitLoc Party Mode (currently no alcohol included). Party mode is a collection of mini-games, that are activated when a portion of your team captures an objective point. Once activated, you will be tasked with a random objective and given around a minute to score as many points as possible. We are also currently in the process of marking out these capture points on all of the stock maps. To give you an idea of how random the capture points will spawn, Overgrown has over 500 points to choose from. So for all you people who want a good dose of humour, or those that want to take a break from the serious side of gaming for a few hours, HitLoc Party Mode is for you. Here are the current mini-games, as promised. Let the party begin! 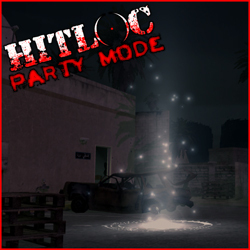 To view the complete and up-to-date list of mini-games, visit the HitLoc: Party Mode guide. To view all games guides and helpful information for our mods, visit the Game Guides page. Posted in News | Comments Off on HitLoc: Let the party begin! We have been hammering away adding updates to both HitLoc and Obscurity for a while now. The time has almost arrived to release these to you all. HitLoc has seen a significant amount of updates that have not been officially released, and we will do our best to detail all the things we have created/added/removed/changed to make this mod what it is. I know I always say this, but keep your eyes peeled for updates to both mods. Over at our Obscure Creations website we’ve got some details about a new game server administration console, called RConTroll. We’d like some people to test out our Alpha release, and give us feedback on where we could improve it. Please check out the page, and if you have any ideas, or you’d like to participate, please register and drop in a comment. Also, if you haven’t been to our biz website before, check out the HitLoc and Obscurity goodies – all proceeds go directly to the creators of the mods!